00:00:00 With pressures of general life, how do you manage the work life balance and how important is that in today’s society? 00:03:35 What sort of advice can you give them with regards to how to perform better at interview or things that you even liked to see? 00:11:51 What experience do you need to build on to make the move from manager to director or head of marketing role? 00:19:06 How do big corporates justify spend on difficult to measure campaigns around brand or thought awareness? 00:24:24 Gender pay gap and the percentage of male versus female leadership roles. Do you think this challenge needs addressing in our industry and if so how? 00:28:12 It’s often said that you can be paid in money or experience. Looking back on your career, how often did you value the experience over a higher salary and did you strike a good balance? 00:31:44 What past failure or uncomfortable experience set you up for success at a later date? 00:37:58 What’s the most valuable marketing skill you can have? 00:46:20 With pressures of general life, how do you manage the work life balance and how important is that in today’s society? 00:52:31 What are the marketing skills of the future? 01:01:35 What’s the best career advice you’ve ever been given or found for yourself? 01:06:00 As a senior marketing leader, what is your guilty pleasure? 01:09:40 What’s the book you recommend the most to B to B marketeers today? 01:14:36 Parting words of wisdom or advice would you share with our audience? Fiona: 00:00:11 Welcome to market mentors, a podcast for the marketing leaders of today and tomorrow. 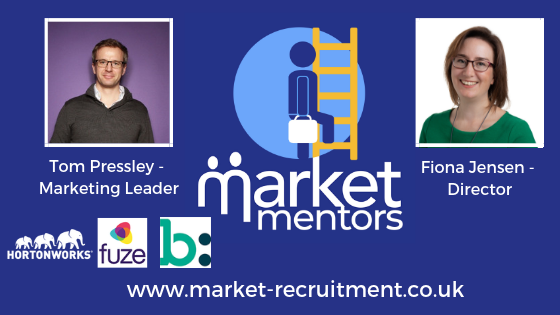 I’m Fiona Jensen, our director and co owner of market recruitment. For over a decade I’ve been helping B2B marketeers find the best jobs with great companies. Together we’ll discover how marketing experts reach the top and learn from their experience. Ask career related questions you can’t get answers to elsewhere. Be tough, be challenged, be mentored. Deep into the mind of a marketer who’s been part of companies that have successfully scaled. Tom, shares insights into the challenges those businesses faced and how they overcame them. Interestingly, how his passion for history and an interest in wine, gave him the inspiration to help those businesses grow. I’m here with Tom Presley who’s kindly agreed to meet us in Putney for recording market mentors. It’s very nice. Thanks ever so much for joining us today. Tom: 00:01:19 It’s a pleasure. Fiona: 00:01:19 What I’d like is for you to talk to us a little bit about your experience. Where have you come from? What sort of companies have you worked for thus giving the audience an opportunity to understand and appreciate words of experience they’re about to learn from. Tom: 00:01:32 Sure. In the technology marketing world, I guess I have had somewhat of an unorthodox route into where I am today. I started out in retail actually working for a UK company called Topps Tiles. They are a tiling bathroom supplier based in Leicester, it’s where I went to university. That was my first job out of uni. There I did a CIM diploma to get my marketing qualifications. I did a history degree at university and then I worked at a company called national car parks. It’s very glamorous job that was too in retail world. That was interesting. It was my first introduction to technology. They were looking to use technology to really develop the proposition that they had and extend car parking, not just to be what it is, stacking cars and chunks of concrete. Actually bringing it as part of the retail journey. One of my roles is to develop partnerships with big high street retail browns and then bring royalty into that car parking journey. Tom: 00:02:37 It was quite an interesting proposition at the time, even though the company wasn’t perhaps the sexiest. At that point it was interesting. I started realising quite quickly the bricks and mortar retail was sort of having it today and that everything was moving online, e-commerce. Then I decided that from the technology exposure that I’d had, that I wanted to get into technology sector and moved into company called Bazaarvoice, this was the ratings and reviews company. That was my real tech marketing apprenticeship. Then from there I moved to Fuse, which is a unified communications company. I was hired there to lead the marketing team in Europe and that was a startup business in the Europe, so I was the first marketing hired there with a team of six people trying to figure out what the hell we were supposed to be doing. It was great fun and from that I then ended up … I was there for about four years and then came to where I am today, which is VP of international marketing at Cloudera. Fiona: 00:03:35 Fantastic. Really good summary. Thank you. As you know, some of our audience might well be looking for their next career move or even actually going through interview processes as we speak. What sort of advice can you give them with regards to how to perform better at interview or things that you even liked to see? Tom: 00:03:54 It’s always an interesting occasion going through the interview process. Personally, you have to get the basics right. Turning up to an interview and not having done your prep to research the company and the person that you’re be interviewed by is criminal really. Not just looking at the website but getting into annual reports, sales figures, being eloquent enough to actually being able to talk about what’s happening to the company. Do they have any key projects going on at the moment? The person that you’re being interviewed by, what’s their background? Everyone’s on LinkedIn these days so you can pretty much get a feel for the type of person that you’re going to meet. The type of character they are by either articles that they’ve written or what’s on their LinkedIn profiles. To not go in armed with all that information is just silly to do that. It just leaves you open for a very poor start to the interview. I think that’s essential. Tom: 00:04:56 For me, I think if you’re going in, you have to be going in armed with your own questions to find out about the company because you have to remember that you’re interviewing them as much as they’re interviewing you. It’s very much a two way discussion and you should always go in with that in mind. You’re trying to figure out the company. Who are they? Are they a good fit for you? What’s the culture like? Is it somewhere that you want to work ultimately? Where is the company going? From your research you should have a bit of a feel for what trajectory they’re on. Are they in a growth phase? Are they about to go into a process where you’re going to be helping to fix things. I think figuring that out is incredibly important as well. Tom: 00:05:39 Then you’re sort of getting into the nitty gritty of the role. Is it the right role for you in terms of your career trajectory and where you want to be taking yourself? Does the opportunity open up doors for you to improve your skill sets or try new things? Ultimately you are there to help the company, yes but also you’re also sort of helping yourself in your career progression and then finally, people always are a bit sniffy about finding out about packages but you’ve got to be figuring out what that is and what you’re going to be paid at the end of the day for providing those services. Fiona: 00:06:24 Make sure it stacks up. Tom: 00:06:24 Make sure it … and I think there is a lot about that, about understanding your own worth, really. Which I think a lot of people don’t know that when they’re going into an interview. If you’re in that stage, the worst position to be in is when you’re trying to go away from something rather than going towards something. You’re trying to escape a company because whatever reason, you’ve just had enough, you want to change rather than actually having a plan of where you want to go next and then going out and see where that is. If you’re going away from something, then you are in a mindset of, “I just want to get out of here. I’ll take whatever is out there.” It’s a very negative mindset to go into but it’s a wonderful thing about talking to recruits as they can give you a good indication about what your market worth truly is because they’re talking to a whole bunch of different people. Ask those questions and find that out before you then go in and start negotiating. It’s obviously not the first question you want to be asking in an interview but you’ve got to have it in the back of your mind. Tom: 00:07:28 Then finally, just figuring out … one thing that’s important for me when I’m meeting people is do I want to work with them as an individual? Someone once told me there’s two types of people in the world. There’s people that give you energy and there’s people that take energy from me and as soon as you get a very good gut feel for who those people are when you meet them. If they give you energy, great. I think a lot of people in an interview process would call that passion. I want to see passion. I want to see enthusiasm for the role. I think everyone’s … in marketing, you have to be kind of engaged and passionate, in order to do marketing. It’s one of the fundamentals but does that person have energy because that energy is responsive to the people in the team. That then sort of lends you to coming into a team. Whether you are going to be a good fit or not. Fiona: 00:09:05 … and whether we’d want to work with them.” It’s that line isn’t it? Fiona: 00:09:11 Try not to go too far but enjoy it. Tom: 00:09:12 I’ve certainly, done that as well. You get feedback outside [inaudible 00:09:17], “We didn’t really get a sense of who you were.” I’m just like, “Damn it.” [crosstalk 00:09:19] ore open and relaxed. Fiona: 00:09:23 Exactly. After this, I think when … and this is the hardest advice I think often from a recruiter’s perspective is, you know that the candidate or the person really wants the job. It’s like their dream job. This is their ideal opportunity and because it’s such an ideal dream job, they become really formal and professional. They try to put themselves forward as this lovely box type marks here that you can just take off the shelf and you know, companies don’t actually want that half the time and it can be counterproductive unfortunately. Tom: 00:09:55 You want to see personality. Tom: 00:09:57 I think that comes out as being genuine. I think that there’s a lot of value to be put in being genuine because that comes out in the work that you do as well. You don’t want to be kind of faking your way through life. You want to be just the here I am, this is what I have skill set and this is the type of character I am and it’d be great to work with you if I’m the right person that will fit into the culture. If you end up faking something or trying to project a different image of yourself, you can end up in a job that just isn’t right for you and then you’re going to be unhappy and you’re sort of wasting time in your career progression. Fiona: 00:10:38 That is very true. Often, I talk to people who have made mistakes like that. Unfortunately they’ve ended up in a company that didn’t deliver what it was that they originally sold, I suppose interview. All their experiences is very different to what they expected. People can be a bit nervous and feel like, “No, I’ve got to sit it out now for a year or so before I move because it’s going to look poor in a CV.” I’m always a bit like well, you’re only on the planet once and if I’m honest, wasting a year or two becoming more demotivated spaces and then feeling like you are just in the wrong job. Firstly you’re not going to do a good job for that company. They’re not going to thank you for trading water for a year and saying yes to people. Fiona: 00:11:23 They want you to add value, that’s the marketers job. If there is anybody out there, basically thinking this is not the right job, I made a mistake, my advice would be just to decide right. It’s not the right job for me. Have that difficult conversation with the company and find yourself the right job because we don’t live long enough to suffer a bad role or a bad job. We’ve just got to go for us and find a job that you enjoy. Tom: 00:11:49 Sage advice Fiona. Fiona: 00:11:51 Stems from what you’ve said, isn’t it? What experience do you need to build on to make the move from manager to director or head of marketing role? This is one of the questions that’s coming from someone who’s maybe found a good job in a nice company and are happy but now looking to step up. Tom: 00:12:09 I remember being in the position myself and to turning over in my head like, “How can I do it?” Because you go in and you talk to recruiters about these potential roles and they sort of say, “Well you haven’t got this experience. You haven’t got that experience and the frustration is always well, how do I get that experience if I’m not going to be given that experience to actually prove that I can do it. The way I got rounded at the time, I will not call round it but develop the skill set that I needed. Is first off to kind of think your way into the job that you want to be getting to. If you’re making a jump from a manager to a head of, go and talk to a head of or a director and understand what their day to day is and understand what the differences are between your job and their job. Then once you’ve actually done that, you figure out what the void is and you can start addressing those skill sets. For example, one of the things that I always knew I wanted to do was to head up teams and manage people. I get a lot of satisfaction out of developing people and seeing them be successful. Tom: 00:13:17 In a former life I wrote quite a bit at university and one of the skill sets that I picked up from there was how to coach. I went and did a qualification and I got a temporary coaching job in my spare time, wasn’t paid or anything it was volunteer, but I viewed it as an opportunity to manage people. There’s a lot of transferable skills there. When you go into an interview and someone says, “Well, okay, this job that you’re applying for requires management of a team of four and I see you don’t have that on your CV.” Say, “Yes, but I have managed a team of 20 plus rowers and I’ve coached them to have targets, personal achievements and they’ve got to have objectives they want to meet, races we want to win.” All this kind of stuff… so managing four people in a business context is going to be a breeze. Tom: 00:14:30 I use that as an example to sort of say, there’s other ways of being able to bypass the sort of natural business hierarchy of getting those skill sets outside the company that you can then bring back in. If you’re not looking after to go to sport or something like that or have opportunities, then a company should support you in that pathway as well. If you’re open and honest about where you want to get to and you don’t … if you’re uncomfortable about saying it directly, you don’t have to sort of say, “I’m after your job.” Well, the next person above you because generally, someone has to make way for you, if you want a promotion but you can ask those questions subtly about you know, I’m interested. It doesn’t have to be in your department. It could have been in a different department or even in another business, where you might have a friend or a colleague to understand exactly what it takes, what it is and what the skill sets are to have that job. The next step up that you want to be at. Tom: 00:15:34 I think when you actually appreciate that, as you said, you can start filling the void in the skills, so when you go into the interview, you can talk knowledgeably about what those skills are and how you could address them. Fiona: 00:15:47 Perfect. I think also if you don’t have someone else within the company or the company aren’t being terribly supportive around helping you train and develop those skills because unfortunately there are situations where your company’s basically are, “No, we don’t want to help or support with that for several reasons.” I suppose recently the, on LinkedIn you can actually ask for quite specific career advice or insight and it stays live I think for couple of weeks or something like that but actually people could come and decide to mentor you or provide assistance or advice. I do a little bit. Unfortunately time, you only got so many hours in a day to be able to do that. I do flick through that section every now and then, see if there’s a question that I feel I could actually just answer. There’s other avenues of trying to get that input. If you can’t think of someone or you don’t know someone ask. Be open and you’ll be surprised at how incredibly generous people can be. Tom: 00:16:53 I totally agree because there is nothing more flattering than someone coming to you and wanting career advice. It is quite a thing when it happens and then you’ll never underestimate that. You’ll find other people no matter what the … incredibly busy in their jobs, they’ll be pretty honest and open with you to say, “Yes, absolutely. I can give you the bits of time, but respect the time that they give you and be professional about it. Book the time in their diary or work with their PA. Block out a bit of time and come prepared for the interview. One thing that you absolutely shouldn’t do if you have a mentor is to come to them and expect them to be a crystal ball to solve all your problems. Tom: 00:17:39 If you come to a session … If I was mentoring someone and then it’s a couple of times … if someone to me without their own agenda for the call, I just close the call down. I’d go, “Let’s reschedule this.” because we’re not going to get anything out. It’s going to be a meandering conversation and both our time is precious and you are not going to get the answers that you want. Go away and think about what you actually want to ask me and I should give you some constructive advice but treat those opportunities professionally because they come around. Getting a good marketing mentor is a very rare thing to get if you haven’t. Not that it’s difficult to get response out of people but someone that’s going to be with you as through your career progression. Tom: 00:18:32 I have only two or three people that I trust implicitly their advice and I very much value and respect their time. When I actually get some time with them in their diary, I make sure it’s quality time, really quality time because it’s unlikely that you’re going to be like, “Yeah, we’ll book in a regular Monday morning, two hour conversation over coffee.” People unfortunately don’t have that amount of spare time so you may be lucky to get to the half an hour here and there once a month perhaps so you have to make sure that time is really used to best effect. Fiona: 00:19:06 Really good advice. How do big corporates justify spend on difficult to measure campaigns around brand or thought awareness? Tom: 00:19:18 There is always a massive pressure on companies for always delivering to the bottom line and especially with all the measurements now those finance people particularly are pressurising marketing teams awful lot more on being able to quantify what their spend is actually producing. You look at big corporates who are spending budgets and have particular budgets for branding campaigns. It’s because I think they understand the importance of actually being front of mind for people when they come to decision making. I taught for business to business context. These buying cycles, a B to C buying cycle is on a daily perhaps weekly basis. A B to B sales cycle can be months if not years. You have to be at the forefront of people’s minds when they’re actually in that position to make the purchase because so much research now is done before they even talk to a sales person. Tom: 00:20:28 It’s all done online. There’s so many assets out there that companies put out there, that companies educate themselves. The ability to actually promote the brand and be first in market because of the brand of thought leadership activity that you’ve done is absolutely essential. Now when you’re actually in a smaller company and you’re starting to build up to actually get that type of budget to do that type of activity is difficult because every penny is being examined about what’s going out the door and was coming back in because there isn’t that sort of supply of cash that a public company might have. The accountabilities are much more immediate but there’s ways you can actually influence that piece and I think when you’re putting plans together as part of a smaller company, you have to think of every type of campaign that you do is a brand campaign in itself, is a thought leadership campaign in itself. Tom: 00:21:32 Don’t just look at the tactic. It’s like we need to do some email stuff or we need to do some digital advertising. When you put the campaigns together, they should be integrated and they should have a brand and thought leadership perspective. Now you may decide that how you execute the campaign requires execution across all these different channels. That’s absolutely fine but ultimately there should be a brand component to that. Whether it’s in the messaging that you’re putting out or it’s in the product pieces that you’re putting together. Brunch should always be at the forefront of any marketing activity, especially now when the B to B markets progressed to a point where B to B and B to c are actually coming really quite close together now much closer than they ever have been because end users are being impacted so much more by technology in their day to day lives so they can actually see the impacts that type of tech is making on their day to day jobs. Fiona: 00:22:41 Interesting. I think you’re right actually. There’s a lot of B to C marketers who are now looking at B to B tech and actually really interested in moving across because they see a lot of opportunity and also the fact that, I think we’ve finally realised as an industry that the companies themselves aren’t big, nameless, faceless organisations anymore. There are people behind those companies and those personas who actually care about how they feel or want to kind of believe in why it is that you’re doing what you do rather than be too specific around and the techie stuff. Tom: 00:23:22 Absolutely. I’m sure people listening to this podcast will have seen the Simon Sinek Golden Circle. That is absolutely the way you should be thinking about campaigns. It’s a very simplistic way of doing it but it gets right to the heart of the of the matter is that I think your question raises and particularly in technology companies. These companies are made up by really clever, intelligent, passionate, technical people, whether they’re engineers or software developers but they’re not marketing people. They don’t necessarily know how to carry the message of the business or its trying to achieve the why to the market and that’s where marketing people come in to help do that and to your point it comes down to brand at the end of the day. Fiona: 00:24:16 A new strategy. The plan, the vision, the marketer who ties it all together and communicates it effectively. Fiona: 00:24:24 Gender pay gap and the percentage of male versus female leadership roles. Do you think this challenge needs addressing in our industry and if so how? Tom: 00:24:33 I’ve got to answer this carefully. Tom: 00:24:37 It’s an incredibly important question and I think not just in marketing, across the board. There Should be very much awareness of gender pay and how it’s divided up. I think that it’s … really for me it’s a two sided coin here. There’s a responsibility of industries and businesses to be aware that it’s potentially an issue. Whether they’re cleared up about, I don’t know, they have to have it. There’s something that they’re seriously thinking about and constantly looking to improve upon. I think the other side of it as well is from the individuals who are going at night. What I referenced before, tend to not get things for free. A lot of this is about understanding your worth in the market and I think between men and women, perhaps men have a slightly more inflated opinion of their worth than perhaps women do. Tom: 00:25:42 I think that’s one thing that mentors can actually help with. Actually going in and talking to mentors or recruiters and actually understanding how to quantify your value out in the marketplace so that actually when you go and have those conversations and if there’s an offer that comes back that genuine to you feels low, you can have an emotionless practical conversation about the pay that isn’t full of emotion. I think when you sort of get down and emotional track it becomes a very difficult conversation and not constructive. You have to take emotion absolutely off the table on it. It is a very emotional subject because we all have mortgages and families and cars and what have you and holidays that we want to be able to afford. There’s a lot of pressure that’s actually put on getting the right package for you but you have to go into one of those conversations in an informed way. Tom: 00:26:46 I think it’s two sides coming together. The employees need to be much more aware about it and have done the research to figure out what they’re worth and the responsibilities on industries and companies to keep making sure that they’re addressing any type of prejudice that’s in their industry. Fiona: 00:27:05 You’re right. There’s definitely … you can ask colleagues, you can ask mentors and recruiters in general will always be happy to have that sort of conversation but also there’s salary surveys. B to B marketing I think do a really rigorous one once a year from market recruitment perspective. We do one every year. In fact, we’re about to launch our one now where you know that data is freely available for you at any point if you wanted to download it. Also other recruiters do that on an annual basis to so don’t just rely on one source, explore multiple sources and then see where you fit into that and then as you say, Tom, you are armed with regards to that negotiation question and the salary. Have they come up with what you feel is realistic for you? Benchmark yourself and then go back with the data and no emotion to explain why they need to reconsider what it is that putting on the table. Always in a positive and encouraging manner. Tom: 00:28:07 Always positive. Absolutely. Fiona: 00:28:07 I say an offer is a good start. Let’s make sure it’s the right one. Fiona: 00:28:12 It’s often said that you can be paid in money or experience. Looking back on your career, how often did you value the experience over a higher salary and did you strike a good balance? Fiona: 00:28:39 Take one tomorrow. Tom: 00:28:40 Absolutely. It’s just the sort of guy I am. Realistically, are you going to go into a job and take no money for opportunity? No. Are you going to go into the job that is incredibly well paid but you’re going to be sat around twiddling your thumbs all day? Hopefully not. It’s about, again, knowing your worth and striking the balance between the two. I think that comes down to understanding the role that you want to be taking, the company that you want to go with and hopefully you do your research and you get that right so when you get into the job, it’s really then down to you to make the most out of that opportunity. Fiona: 00:29:23 Well. They’re not going to come to you with your dream job. Nobody ever hands that to you. Tom: 00:29:27 No, no one ever is. What you can do is be inquisitive have a plan. Go out and try and milk a job for all it’s worth. No one is going to say … if you volunteer yourself for a whole lot of different stuff, no one’s going to say no. Everyone loves people who are keen to get involved in roll up their sleeves and get stuff done. That should never be a concern. In a world that is so competitive in the job market and if everyone’s scrambling to the top. We’ve had questions today about how would you make the jump from manager to head off? You really have to seek out those opportunities that are going to give you that jumping board because if you’re not, there’s probably someone else that either you’re working with or that’s external to the company who looking for that advantage. Tom: 00:30:17 It’s about being proactive and looking, using the company for all the opportunity and experience that you can get while you were there. As marketing people who are in such a fast pace developing world. I think if you look at any job description, it starts off with you must enjoy working in a fast paced environment. That’s just marketing day to day. Tom: 00:30:42 It’s not 9:00 to 5:00 and it never has been. You don’t clock in and clock out of a marketing job. You’re always thinking. You take stuff home in the weekend. You don’t necessarily have to be at your computer but you can be thinking about what happens next week, campaigns, what do I need to plan? That’s one of the reasons why I got into marketing. It’s the matching the logic and the creative element of it to either fix things or problem solve things or build things. That’s really the most important thing of making the most out of a job that you’re in. Fiona: 00:31:18 Market mentors is produced by RockWood Audio, a subscription production service that takes the pain out of podcasting. From advice and support to editing and production to music and artwork. RockWood Audio has you covered so you can stay focused on your goals. Better, faster, easier. RockWood Audio, save time, sound like a pro. Fiona: 00:31:44 What past failure or uncomfortable experience set you up for success at a later date? Tom: 00:31:54 I don’t have failures. I don’t know what your talking about. No. [crosstalk 00:31:59]. The sort of person I am, I have failure every single day that I can … I’ll look back on this interview and think I could have probably done it better and that’s just sort of the person I am, that’s how I learn and I’m always looking to do one better than I’ve done before. Whether it’s sending emails or doing speeches or what have you. For me that is a good way of approaching life. If you’re always trying to be one better than you were yesterday you’re always going to keep going on a positive trajectory and that’s going to help you start developing skillset and always be looking out for the next opportunity to better yourself. If you’re looking for a more seismic example I suppose from my personal history, I always remember walking into my first … I’d just got my first senior marketing role and I was to give a marketing update to QBR, a quarterly business sales review. All the sort of leadership team are in there. There’s the sales guys and finance guys and all the heads and team and the update I gave was similar to an update I would have given to a marketing director. Tom: 00:33:24 It was about, here’s the campaigns that we’ve done, here’s how they’re performing, this is working well, this is not, kind of really interesting granular marketing stuff that as a team we’d be pouring over and thinking how can we do? Yeah, for me it was very interesting I was like I’ve spent hours putting multiple slide decks together and making it all look pretty and then getting all the animation sorted and I think I lost the room within about the first three slides. They’re all on their phones or scratch or making coffee or whatever. I kept pressing on and I think I’ve run out of time in the end before I came to my grand finale closure. From that has stuck with me for years because it’s a feeling of completely having misread an audience I suppose and I was very angry with myself, I still am really. It still makes my head ache, the scars run deep. Fiona: 00:34:37 It shuttered down the spin. Tom: 00:34:40 Exactly. Yeah but it taught me especially internally. An old boss of mine call it the marketing of marketing where you have to put across your key messages to an audience that doesn’t really understand marketing or what marketing does but you have to pick out the top three things that you wanted to take away from the session and condense your 50 slide deck into five maximum. Because in my experience in marketing has its place within a QBR but it may get moved, it may get cut from 45 minutes to 20 because of how things are over running, a more important topic might be sort of put out and put on the table. You’ve got to be ready in a very kind of crisp update and that’s really stuck with me going forward. Tom: 00:35:29 It’s about how to talk … we’ve talked earlier on about people making that jump from manager level to head of and director of and all the rest of it. There is a different way of talking as you go up the chain and you have to understand what is of interest to your audience as you move up the grade. It’s an important piece to take away because if you get it wrong as I discovered and never to do it again you sort of lose interest in the first instance and potentially if it’s really bad, you lose respect of the people that are there as well, I don’t want to scare your listeners by saying that but it’s an important point and certainly a very valuable lesson that I learned. Fiona: 00:36:12 It is but also I think having met a lot of senior marketeers looking back, I think you’re right. The whole tone, communication style it’s simpler, it’s concise and it just delivers a huge amount more value and sometimes I think that’s because you’re so used to now talking to people who don’t necessarily understand marketing all the granular stuff that it just becomes a style in general for how you communicate about everything. Actually the earlier you can get to that type of communication style the easier it will be for you to move through the racks. Even though we all love the data and we all love the metrics and the conversion rates and get all the maxing terminology out of your system now but if you do want to succeed and progress certainly from my own experience it’s all about delivering really concise but valuable insights and information. Tom: 00:37:13 Yeah. Less is more the rule still stands today even with all this information available still absolutely fundamental. If people want to dig into stuff that you say because they find it interesting, let them do that. That’s obviously absolutely fine but they will dig in if they want to but don’t give it to them all upfront because it’ll be too much and they’ll switch off. It’s all about you want to kind of lay little breadcrumbs to the marketing genius that you’ve put together so people can actually get engaged and get excited about it and get interested in it and that’s a skill set that I’ve certainly learned that’s put me in good stead. Fiona: 00:37:58 I like it. What’s the most valuable marketing skill you can have? Tom: 00:38:03 This is going to sound really simplistic but learn how to ask why. Why something like that? Why did this campaign work? Why did that not? Why is that competitor doing that activity? Why is this company taking this decision to go that way with that strategy? The more you can ask why the better you’ll start understanding the objectives of the business, your purpose in the job and how to be successful. Tom: 00:38:40 This is relevant, whether you’re just starting out or your right up at the top. There is always more that you can understand, the more that you can learn as a marketing person and build that ability to be inquisitive and then apply the answers to refining your marketing plans is a key skill that I don’t think it’s used enough really in the industry. Fiona: 00:40:58 No, I like it. Tom: 00:40:58 … a classic skill set of you must learn ABM or you must learn email marketing or yes, obviously you should be learning all of that stuff as well as part of your basic training but as a key soft skill that perhaps is a little bit different from the norm. I’d absolutely say that taking that approach to your professional life will put you in very good scale. Fiona: 00:41:23 Very good. So we’ve got quite a specific question. Tom: 00:41:29 I try to giving you a specific answer? Fiona: 00:41:34 Yes, if you could so you’ve got, even with heaps of preparation, coaching and development and move to a more senior role I’m about to move from senior manager to head of. I can still feel daunting and peers in a similar position of liking the first few weeks to winging it. What advice could you offer someone moving into a senior role where there isn’t a huge peer population to support and the pressure is on to make a good impression? Tom: 00:41:59 That is very specific, isn’t it? That’s good. I’m sure it’s a scenario that will resume a lot that your listeners You can either be someone that, for want of a better phrase, fakes it till they makes it. The way I approach it is to use your personality strengths to your advantage. Businesses don’t expect you to have all the answers within the first two weeks that would be impossible. If you come to a role and come up with some sort of groundbreaking brand strategy, people are going to ask. If you suddenly go come up with a strategy and go and ask finance for 2 million quid and you’ve only been there for two weeks, they’re going to start raising eyebrows and teeth and asking some deep probing questions. Tom: 00:43:30 Companies are always going to give you a bit of time to learn the business, get out talk to people and get educated about the space, the market because no matter how much prep that you do for an interview let’s say there’s always a whole ton of stuff that you uncover when you actually get into a business and start talking to the people and getting used to the team and all the rest of it. Fiona: 00:43:49 The stuff they don’t tell you. Tom: 00:43:52 Exactly and there’s always something. Tom: 00:43:53 It’s never 100% transparent because they’re selling the company to you as much as you were buying. Fiona: 00:43:59 They need you. Tom: 00:44:02 Exactly. In terms of how I approach those first few weeks I come up with a very simple plan and I hold myself accountable to measurements against that plan. Now that’s not a marketing plan, that can be as simple as, over the next three weeks I’m going to be going out and talking with this person and this person visiting this customer, being on that sales meeting to whatever and I plan to do this amount of meetings by this point and making it very practical like that so that at the end of your first month, if someone asks what the hell you been doing for the last four weeks you can say, “Well, here it is. I’ve gone out. I met this person I’ve met [inaudible 00:44:49] to the business, been with product people. I’ve got that,” Make sure you’re documenting all this stuff as well. Tom: 00:44:57 You can say, “Well, I’ve discovered this stuff. I’ve come up with these questions. This is now my initial feel about where I want to be heading towards. I intend to come up with a plan that I’ll present back to the business on such a date.” Actually by having that approach and going out and talking to people you can start figuring out if there’s anything incredibly urgent that needs that you need some jump on sooner rather than later hopefully they would have actually told you about that but do you know what there’s probably some stuff they told you about and some stuff that they don’t know about because you’ve actually gone off and taking the time to do the digging yourself and you’ve found some solutions to problems that you didn’t expect to find but you’ve also uncovered some new problems that actually could be more important than the other ones that you were told about. Tom: 00:45:50 Having a structure like that puts you in control of your first, let’s say episode at a business, let’s say the first three months and it gives you that opportunity to be structured, to be flexible within a structure and gives you a message of being accountable to the people above you so that you can have a nice free flowing conversation and you are getting increasingly equipped with knowledge about the business. Fiona: 00:46:20 Great and really useful tips and advice there. Thank you. With pressures of general life, how do you manage the work life balance and how important is that in today’s society? Fiona: 00:48:05 Have an impact. Fiona: 00:49:00 Everyone else is on holiday. Tom: 00:49:14 … avoid that like the plague. Yeah. I do get quite sort of passionate about it because it is an important part of working life, but it needs to be, again, it’s a two way street and employees absolutely should never feel that they can’t go and speak to the manager or leader about the fact that they need to take a holiday and if the, that is not an option, then you shouldn’t be working at that company because it’s clearly not good for your health. Fiona: 00:49:47 Yeah. Look after your own physical, mental health wellbeing and the day job will look after itself as well. I think it is that personal investment and also I think it also comes down to trust sometimes because it’s like you’ve got to trust the team, you’ve got to trust yourself, you’ve got to trust your manager to be able to cope without you there. A lot of what marketeers are doing nowadays is working a lot smarter. You’ve got automation. If you feel you need to be in the office 9:00 to 5:00, 365 days a year, you might be doing something wrong. Fiona: 00:50:27 Because there’s some amazing tools out there now that can really help you with this type of stuff. Tom: 00:50:34 Absolutely. Yes, one of the companies that where I was heading up the team, I had someone in the team who desperately wanted to take her two children to a sports lesson on a Wednesday afternoon. I think it was for whatever reason, the calendar was set for Wednesday afternoon and I see the activity was something like between two and four in the afternoon and the nature of the company was that there was a lot of remote working and flexibility and so me as a team lead and I was like, “Do you know what, if that’s going to make you happy and make your family happy, providing you make the hours up at some of the time and your work doesn’t suffer, fine. Absolutely no problem.” Now I appreciate that was a smaller company and some of these bigger companies are a bit more rigid in their structures. Tom: 00:51:24 I think, this comes back to what I was saying earlier on about identifying the type of company and the type of way of working that you want to work for in the type of business that you actually gone and and commit your time to because it is very important, If you’re not happy in the work that you’re doing, that’s going to massively impact your life in general. If your not on the top of your game mentally, emotionally, physically, you’re not going to be very effective at work and that’s going to impact your career progression. People are going to stop going to work with you and your then on a tricky downward spiral. You have to sort of participate. Someone said to me, you have to participate in your own recovery. I think it is what I said so by, and again this comes back to no one’s going to bring it on a silver platter. You have to get involved and participate in it and that requires communication with the people above you. Tom: 00:52:26 Being honest with yourself. For sure. Fiona: 00:52:30 Because we are not robots. We need a break. Tom: 00:52:31 Exactly. Not robots yet. Fiona: 00:52:31 Yet, yes, that’s true. What are the marketing skills of the future? What do we invest in, growth Hacking inbounds, IBM automation? The buzzwords get on. Tom: 00:52:43 Oh Lord, they do. The basics that are never going to go away. There are still customers that have issues that need addressing. There are still companies that have products that address those issues and there is marketing people in between that connect the two together. There are skill sets to do that and toolkits. I did a [inaudible 00:53:10] CIM diploma. When I was younger I was involved with the IDM as well. These are great institutions for teaching you those basics and you shouldn’t shun away from learning them because they are, I’m a big believer in doing simple things well and if you do the simple things well, the rest takes care of itself so if you’re building a house. You don’t create good foundations. The rest of it is going to fall down at some point. Tom: 00:53:38 I think doing those basics absolutely important. Now in terms of the future, I think those, I look at sort of three areas where I think people can steal a bit of a match and I’m not one for buzzwords. This is sort of a bit more general than that. Really understanding how data impacts marketing is a big one and then from that, I mean we are as a profession now inundated with so many different platforms that we could use, I worked at a company that had about 40 plus different software applications in their tech stack and in each of those had a dashboard. In the end we had to get a dashboard to summarize the dashboards because it was that complex it took two months crazy. There is absolutely a requirement to be able to take data outputs from the campaigns that you’re running and platforms that you use and understand how to transmit them into what you do in the future, because there’s no point to getting all that data and then either sitting on it or it goes in a graph and that’s what I do on my day to day. Tom: 00:54:53 You have to actually be able to understand what that data is telling you and then go off and course correct your marketing plan on the back of it. I think with the data side of it, if that piece is about, not necessarily understanding all these different platforms to the ends of the earth but it’s understanding what to look for. I’m not, you can always get bogged down in data, the paralysis by analysis phrase, I hate it but it is true sadly. You have to be able to look at the numbers but then also be able to dial it up several levels to give you some directional movement. Otherwise, why are you collecting all the data and analysing it all the time? Tom: 00:55:42 You got to be able to do that. You don’t have to be a mathematician, but you have to be comfortable with data and numbers and transferring them into action. The second thing I would say is it digital execution and by that I mean the world is predominantly digital now. I read there was a chap called Mark Ritson who contributes a lot to magazines like marketing week. He’s a professor of marketing in Melbourne I think these days. I’m a particular fan of his robust thoughts on things and he wrote recently that don’t … there is no digital marketing. There’s just marketing and it’s absolutely true like in digital is just now part of the mix that you have to use when you’re actually putting your plans together. It is still a relatively new avenue for people to actually go and learn about. Tom: 00:56:47 When I say digital execution, that means putting your plans together for sure, but actually understanding it’s a new routes to market. There’s a lot of, there’s been so much development with digital now that you can reach very tailored specific audiences with very tailored specific messages and doing it very cost effectively. Gone are the days where you only had four TV channels and you were, and only two of which were commercials that you could put TV ads out and that you could guarantee your audience of millions while everyone was putting the kettle on during coronation street. Those days are gone but the benefit is that you can now use all these tools and platforms to target the absolute people that you want to be talking to with very specific and relevant messages. If you’re not doing that, people think you’re a bit lazy as an outfit. Those opportunities to do that and message in that way exists and you’re not using them, you’re not doing your marketing very well. Tom: 00:57:48 I think understanding how to the digital element of executing a campaign is important. Then topically we’re recording this in March, the Brexit vote is not far away, being open to international experience as well. The world is a very small place these days. It’s funny I started out my career to UK based retailers. I’m now in a job where I’m flying out to Asia and the U.S and so it’s really opened up for me how small the world is commercially. How boarders don’t really mean an awful lot when there is customers that have needs and you have a particular product set that you can actually deliver to. Fiona: 00:58:40 Especially in tech. Tom: 00:58:41 Especially in tech. Incredibly relevant in tech. Being open and willing to get out and do travel and just getting out into the field. If you have the opportunity to get out and see how people do marketing in other countries and what response, how people respond to different messages and ways talking is phenomenally important. Fiona: 00:59:08 It gives you ideas, doesn’t it? As well it gives you new perspectives, new opinions and I suppose with regards to Mark saying the more opinions in the viewpoints you garner and understand and appreciate, the more effective you can be with how you communicate, not just to those audiences but beyond. Tom: 01:01:18 That’s a wonderful thing at the moment is that there’s so much opportunity, out there to work for different companies. We are so blessed that English is our native language, that it opens up a lot of doors for us to be able to go out and try working in new companies and new geographies to get more wise about how to market with them in the feature. As we progress and as the world develops, it’s only ever going to get smaller. Our transportation is getting it more efficient, more quick. Recently the sort of nonstop flights to Australia have started coming out, so even the opposite side of the world, it’s not actually as far away as it used to be. That trend is only going to continue obviously. Hopefully with more greener ways of actually getting us there. Finish off that one. I think that international experiences is great one. Fiona: 01:01:35 Perfect. What’s the best career advice you’ve ever been given or found for yourself? Tom: 01:01:44 There’s a funny story that, the only real piece of career advice in its pure sense that I was given was when I was about to leave university and I’ve done a history degree and I went to see the careers adviser and they said to me, “Well we advise you to be a history teacher.” I thought right, okay. I don’t want to be a history teacher so I bet score from start talking to people and finding out exactly what I wanted to do next. When I started talking to friends, family members, colleagues, people that I knew who were in different industries and so sort of found my way into marketing, as in a blend of my creative and logical brain, that I think I have. That then sort of got me into the marketing world and I think this comes back to a point of no one’s really … It sort of highlights that no one is going to tell you where you should go in your life. Tom: 01:02:56 It’s a really annoying thing cause you got to talk to careers adviser hoping that you’ll get career advice but it’s never delivered on a silver plate. You have to go out and find the answers for yourself. The first thing that … and this was the already given to me though over time I sort of figured it out, is that you have to understand yourself first. What gets you out of bed in the morning, what excites you, what type of people do you like to work with? What type of work do you like to do? And only when you figured that out, to need then go out and start looking for companies that fit that profile. I don’t know, sort of when you were coming into your first job, you’re just happy to get a job but at least you can have a loose gearing on whether that particular company is going to be a good fit for you or not. Tom: 01:03:51 Don’t generally try not to sell yourself too short if it’s that first job. I know it’s incredibly competitive getting on the career ladder but when you’re on there, you can then start getting, navigating your way up as everyone does you sort of develop as a human being, an individual as you go through your career and you can course correct as you go. That’s when you can start actually picking up these mentors who can help guide you. You have to participate in that process by coming with very specific questions that will help them to guide you through your career trajectory. Fiona: 01:04:34 Interesting, so if you see someone, he thinks having fun and you want to understand how to do that, how’d you get involved with that then? Just awesome. Tom: 01:05:28 Exactly, and it’s one of the wonderful situation to be in. It’s like, “Yeah, I fancy a bit of that actually. She was dead right and that’s how I got into the technology sector, intelligent marketing. Always put good stock in talking to people, even if they’re not the person that you’re aspiring to be professionally, talking to just friends and family, you’ll never know what’s going to pop up by having open, honest discussions about careers. Fiona: 01:06:00 Very true. As a senior marketing leader, what is your guilty pleasure? Tom: 01:06:00 What is my guilty pleasure? Well, it’s a 40 guilty pleasure, but it’s wine. Fiona: 01:06:06 I like wine. Tom: 01:06:11 Who doesn’t right? It’s great. Fiona: 01:06:12 We’ve done that wine. What’s wrong with you? Fiona: 01:06:55 I think I had them the last event I went to. Tom: 01:06:58 Everyone has that. They are the sort of go to of wines that people order when they go out drinking because everyone likes the but I’d be looking at these wine list thinking of, “I wish I knew what all the rest of these wines were. I’m sure they’re perfectly nice but I just don’t know anything about it.” I went off and did a wine course and it’s just like an eight session course very sub crash things and discuss … made some discoveries. One, it seems like don’t have a pallet at all. I don’t have any knowledge of horticulture so when people were telling me that we’re getting notes of gooseberries and cherries and I was smelling all trainers and stood like dump corners of old managing. Tom: 01:08:36 Yeah, it’s a kind of strange off the wall additional benefit to bring it in to the marketing. Fiona: 01:08:47 [crosstalk 01:08:47] doesn’t it. The experience and it’s nice to be able to have something else talk about when you are out at some events as well, because sometimes people just don’t want to be sold too. They’re there because obviously it’s relevant and you’ve kind of picked the right person who’s looking at the time and obviously needs to understand more about your product or service but you know maybe they’d much more enjoy having an hour of the conversation over a good glass of wine rather than,[inaudible 01:09:16]. Fiona: 01:09:22 Maybe not the way to go. Tom: 01:09:23 … drink responsibly kids. Fiona: 01:09:37 Yes, gets creative juices flow, doesn’t it? [crosstalk 01:09:38]. Fiona: 01:09:40 It’s very good pleasure. What’s the book you recommend the most to B to B marketeers today? Tom: 01:09:51 I’m not one that can really get into a lot of business books I find quite dry. Some that I’ve read has been incredibly valuable but really the stuff that I like reading and this comes back to my degree is history books. The reason I like history books is because if you read them at face value and a lot of the wording that is included in certainly in military history books, it’s a lot of the same that we’re dealing with in a marketing constant context. There are companies, there are campaigns, there are tactics, the oldest kind of different stuff. I like to think that we’re in a bit of a battle against our competition when we’re doing all our marketing activity and you actually start reading about not just the sort of the military aspects in the wars, but actually the personalities that are in there as well. Tom: 01:10:55 You start actually seeing quite a lot of parallels between organisations and how they operate and armies and how they operate and the politics and stuff behind how those armies are used. I just find the detail, understanding the detail and historical detail. I’m a big believer in, there’s a lot of examples in history and it is cyclical that you can then apply that to what’s happening in the future. It’s still valuable to actually bring that learning into work and it’s subject matter that I really enjoy reading. They want one book that I did read it’s not a history book, but one that I’ve found quite compelling, slightly different. It’s a book called the great acceleration and it came up a couple of years ago and it was a book that basically tells about how different elements of the world are speeding up. Tom: 01:11:50 The premise of the book, I think they measure how people, how quickly people walk from one part of Waterloo Bridge to another and they sort of served, surveyed a decade ago or 20 years ago and they’ve done it again and people are walking more quickly. Then they look at sort of what’s happening in politics and what’s happening in the news and all this kind of stuff. They’d sort of touch on the how technology’s influencing it all and how, we’re all becoming so immediate. Let’s take journalism as an example, there’s investigative journalism is kind of on the wane and there is so much of pressure on journalists to get, be the first to the story, to the point where I think they give an example of when there was a bombing in Boston during the marathon that they used, what information they had to accuse someone quite incorrectly of being the bomber and people actually mobbed to that person’s vocation. Tom: 01:12:50 What actually is the person who had actually nothing to do with it but because of the pressure of the media outlets of getting up to see the news out there and getting updates through … there’s a lot of miscommunication that goes out there. I found that fascinating and especially how as consumers were then being shaped to have expectations about the media that we consume and obviously for marketing people doing campaigns and pushing messages out. You’ve got to be cognizant of that. Then the last part … the books I’m reading at the moment is … it’s book called mythos by Stephen Fry, which is a retelling his version of retelling all the Greek myths. I liked them because they are, they not simple stories in themselves, but the Greeks just found really interesting ways of retelling the basic sort of creation myths. Tom: 01:13:50 Stephen Fry talks about, it’s just nice stories that he grew up learning about … and they obviously have some hidden messages in fables and stuff and that behind them. As marketing people, the reason I like it, we are storytellers and sometimes we have to tell stories in a different slant or a different version in order to get our points across. I found that a really interesting read from that sort of creative writing perspective, they are just good stories. The Greeks were bonkers, but the stories that they came out with were really good and engaging. Fiona: 01:14:24 I love the fact that you draw inspiration from such a huge variety of sources and areas and how there’s always a marketing connection. Tom, it’s really inspiring. Lovely. Fiona: 01:14:36 It’s lovely. Parting words of wisdom or advice would you share with our audience? Tom: 01:14:46 Just to keep things simple, just don’t get bogged down in detail. Try and take the most simplest view that you possibly can and don’t get … Don’t feel that you have to know everything. It’s okay not to know everything but just be open and honest about it. I think you know, I run my life by my professional life by three mantras. Three simple things. The first is do the basics, get the basics right. Second is to do simple things well and the third is always do what you say you’re going to do. I think if you can combine those together and always take those into whatever project or activity or tactical strategy that you’re doing, you’ll actually find that you take a lot of the stress out of putting plans together and you start nailing down to what actually is the thing you are trying to achieve. I don’t even mean that in terms of putting campaigns together. That can be your personal career desires. It can be doing an interview, it can be researching a company, whatever. If you can just simplify things down to what is it that we are trying to achieve, I’m trying to achieve and do the simple, logical steps that you to get you there, I think you’ll always be successful. Fiona: 01:16:19 Fantastic. What a lovely notes and leave his son. Thank you ever so much for your time, Tom. Really appreciate. Tom: 01:16:24 It’s been an absolutely pleasure. Fiona: 01:16:26 There you have it. Career advice from a real marketing expert and leader in the field. Thanks for listening. If you enjoy this podcast, then please leave us a review in iTunes. We’d love to hear your feedback.